It all starts with a dream – one person, one idea and one seemingly unattainable dream. That’s the origin story of WhiteWater, and we’d wager that it’s the origin story of most of the brilliant things that humanity has achieved in the course of history. Over the last four decades, we’ve committed ourselves to helping others realise their dream—whether it be creating unforgettable experiences or pushing the boundaries of what’s possible. In short, if we can do it, we will. In line with this, we recently introduced our new tagline: “Entertain the possibilities”. It’s a reflection of our vision to make the impossible possible through a combination of in-house creativity, engineering, and production based on decades of tried-and-true methods. Our current brand advertising campaign, “Be Boundless” is an extension of the idea that barriers are meant to be breached. That’s how discoveries are made. As market leaders, we put our success down to our attitude. There’s a lot to be said about staying true to our roots and never forgetting what our mission is: To help parks solve problems, create immersive experiences and delight guests. We’re only successful if our clients are, too. This is why we truly believe in building relationships and forging lasting partnerships – we stand by our products and are always happy to help clients even years down the line. Over the years, we’ve made it a priority to identify not only what parks and guests need or want, we’ve innovated on what’s in the market and invented new products that help make experiences better. Amongst some of our most memorable inventions are the Mat Blaster, the world’s first uphill mat racer, and Smart Blast, the first energy saving VFD water control technology, both of which were Brass Ring winners. Additionally, Slideboarding, the world’s first interactive game in a slide won both a Brass Ring and a TEA Thea award. Over at FlowRider, our WaveOz became the world’s first 180° stationary wave. We recognise that we don’t have the exclusivity on good ideas, so we’re always on the lookout for exciting and interesting innovations that we can manufacture with licensing agreements. As a result, we’re able to bring our clients the very best on the market with the convenience of dealing with only one supplier. Recent licensing deals include Life Floor – an award-winning aquatics flooring company which manufactures safety surfaces specifically designed and engineered to perform in wet environments. We’ve also partnered with Wiegand Maelzer to make their iconic SlideWheel – a ride that combines strong G-forces, backwards sliding and pendulum movements. We’re proud of our waterpark heritage, but we’re excited about branching out and the opportunity to be part of the vast world of entertainment. Two new attractions products, No Boundaries and Raft Battle, are innovations that transcend theme parks. No Boundaries is a completely dry attraction that combines a vast array of activities from zip coasters and climbing obstacles to traversing bridges. 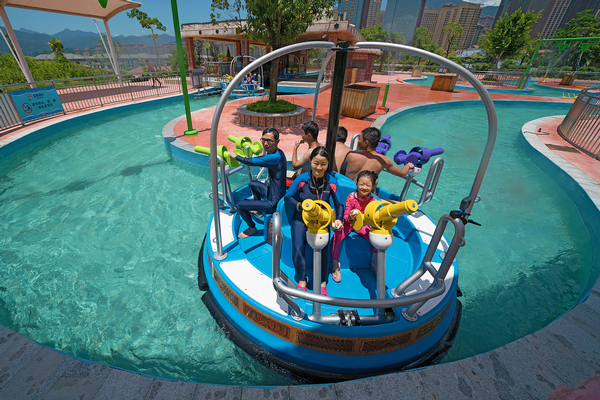 It’s a high capacity attraction that’s compact in size yet features over a dozen activities to keep guests of different ages engaged for hours. Raft Battle offers interaction between riders and spectators. 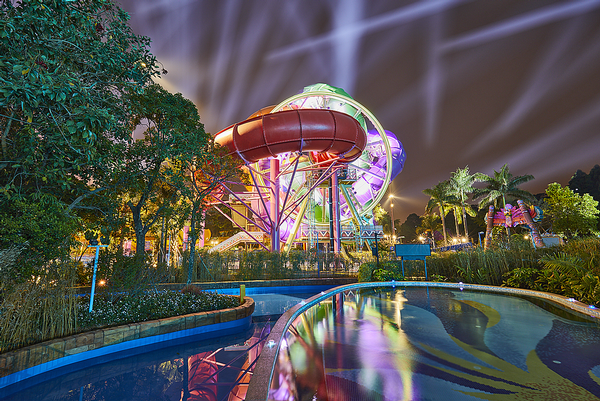 Inspired by epic water battles, guests can not only ride “on” water but also “interact” with it. In the experience, they can battle from boat to the shore, from the shore to the boat, and from boat to boat. One of the most interesting things that Raft Battle offers is the infinite theming options—boats, layout, and fixtures can all be customised however park owners see fit. The latest WhiteWater product to hit the market is the best proof of our “boundless” approach. Vantage is poised to completely alter the way parks are managed and run. The idea to create Vantage stemmed from the age-old belief that knowledge is power. We want to not only invent the biggest, best rides for guests; we wanted to help parks succeed. Some of the questions that we ask are: What would help make people safer? How can visitors have more personalised experiences and shorter queues? How can real-time analytics help operators boost performance? It all boils down to that fact that the more we know, the more we can make sound decisions and improve on what we’re already doing. Vantage translates guests’ behaviours into meaningful insights and enables venues to make real-time, strategic decisions that optimise park operations. Its pioneering guest engagement software empowers guests to customise their entertainment and better navigate venues for a superior guest experience.